Successfully Added VKWorld F1 Android 5.1 Smartphone - 4.5 Inch IPS Screen, Bluetooth 4.0, SmartWake, Two Cameras, 1850mAh Battery (Gold) to your Shopping Cart. 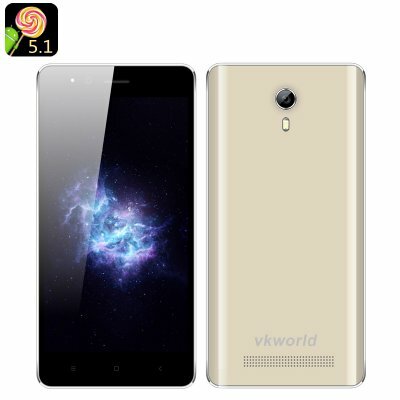 VKWorld is a famous Chinese smartphone maker and their latest model – the VKWorld F1 – comes with a lot to offer. First, you’ll have Android 5.1 interface – a greatly improved operating system with better customization, speed and other upgrades. The smartphone will also introduce you to a great navigation shortcut – Smart Wake. The feature lets you access some of the most popular apps from the locked screen. For instance, you can simply “draw” an “E” on the smartphone’s display (when it’s locked and black) and your default browser will open up instantly. The shortcuts are available for Camera app, Messages, Contacts and more. The 4.5 inch IPS screen may not be as bog as other models’ but follows a trend of the return to smaller displays. A great number of users find screens under 5 inches easier to use and operate – especially when using the smartphone on the go. Smaller screens also make the devices more portable and reliable – a large screen phone is much more fragile and easier to damage. The VKworld F1 Smartphone comes with a 12 months warranty, brought to you by the leader in electronic devices as well as wholesale Android Phones..
For the price fantastic. Bought it for a friend and no complaints so far. Everyone that sees it wants one.